What kind of business are you in? How do you bring money on the table? Remember, regardless of your business, high turnover and sales revenue is the lifeline to your business success. Cash flow to your business is like blood circulation in your body! Once again: as a business leader; how do you bring money on the table? The WayOfTheGuerrilla marketing and sales training is to help unlock your business to sell more on a shoe string budget. Whatever business you are in, it is really a “marketing business.” As A Strategy and Risk expert, I have been through books after books and workshops and absolutely nothing comes close to the program I have carefully set up the WayOfTheGuerrilla marketing for higher leads, higher sales conversion rates and client retention. I learnt these tools from The Way of The Guerrilla Marketing training. I am happy to have made the investment. You too, will. 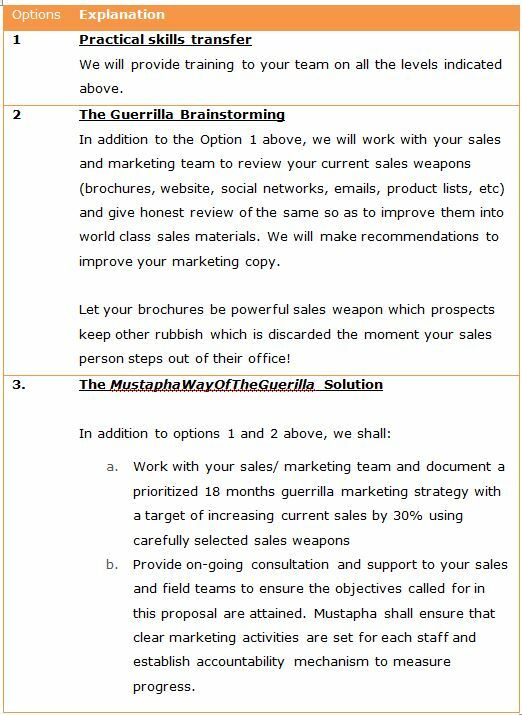 The Way of The Guerrilla Marketing Course will help you and your sales people pick up all the sales and profits most insurance agents and salespeople leave on the table. Are you happy with your current sales? Do you sometimes think your conversion rates are lower than your leads? Are your staff giving you more excuses for low lead conversion rates? Are you optimizing the power of the Internet to make more sales? Are your sales people incessantly calling/ emailing prospects and inconveniencing them instead of being called back to close the sale? Are worried about low client retention? It does not matter your current job description or kind of business, if you are unable to generate new sales, you are in a wrong business. Any business is about generating new clients and keeping old ones. In this training, I will discuss proven strategies to get new customers even on a shoe string budget. After all, you don’t have to spend a fortune to sale! Please note that each day is a one hour session. You have an option of doing the course in three days. Day 2- The 16 competencies of a super sales person for maximum results – plus how to sell your insurance policies through powerful stories and storytelling. Day 11- Guerrilla Marketing strategy, work plan documentation and attack strategy (per individual). ** Plus lots of resources to take your marketing to the next level – free sales letter templates, sample guerrilla marketing tools and free guerilla marketing handbook. You will improve your success! And lots of surprises. To increase your sales skills and sales conversation; with measurable sales revenue increasing by 30% within 12 months of the training. Avoid irritating people with sales literature, incessant phone calls and emails; by becoming an irresistible provider everyone wants to work with. Create irresistible marketing weapons that bring more clients than push them away. Bring money on the table so that you don’t have to worry about paying bills. It feels good to have customers looking for you, right? To book, contact us now.